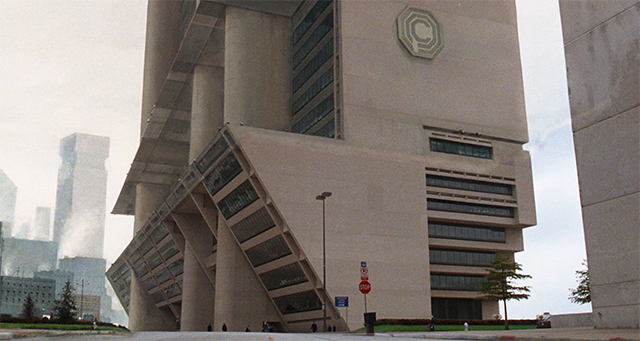 To mark the movie's 30th anniversary, actor Peter Weller will be on hand for a live event at Omni Consumer Products HQ, aka Dallas City Hall. RoboCop was released 30 years ago today, but the biggest anniversary celebration of the prescient sci-fi film’s legacy is coming Sept. 10. It’s then that actor Peter Weller, who played the man-made-machine law enforcement officer, will return to evil mega-corporation OCP’s looming headquarters: I.M. Pei’s Dallas City Hall, made all the more formidable by the special effects of 1987. Weller will participate in a Q&A at the Dallas event, organized by the SyFy channel and Alamo Drafthouse, which will stream the proceedings at theaters around the country. Photo opportunities calling to mind the sinister future Detroit of the film will be plentiful, although the food trucks and bars with RoboCop-themed cocktails might break the dystopian illusion. The movie itself, a thoughtful critique of corporatization and the role of law enforcement in society with a heavy dose of explosions and android gunplay, will screen out on the plaza. The film holds up. Tickets for the party at City Hall go on sale Aug. 1. Before that event, you may be interested in taking a downtown tour of the film’s Dallas shooting locations, which we mapped out earlier this year. I.M. Pei’s brutalist architecture as it appears in RoboCop. Photo courtesy of Orion Pictures Corporation.